It's almost Halloween! This year I've been perfecting the art of pumpking carving, with a green theme. I designed one with a recycling symbol, one with an endangered whale, and one with a bicycle. And that was just to start! Yeah you designed them but when you went to carve them, your pumpkins completely fell apart. You forgot to mention that. Well, sure, but it's the thought that counts, right? I've got a whole year to practice for next Halloween. Yeah, keep working on it! 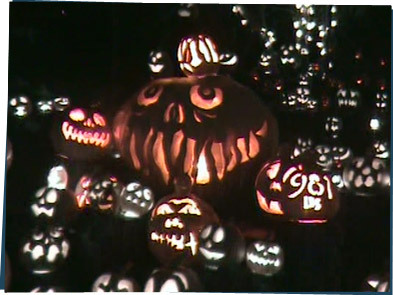 Next year I want to see a whole jack o'lantern city on our lawn, like these pictures from the Jack-O-Lantern Spectacular in Rhode Island.